Through blogging, I have been able to widen my knowledge about other cuisines and learn new recipes. Divya's South Vs North Challenge is one such platform to get to know and try authentic Indian recipes. 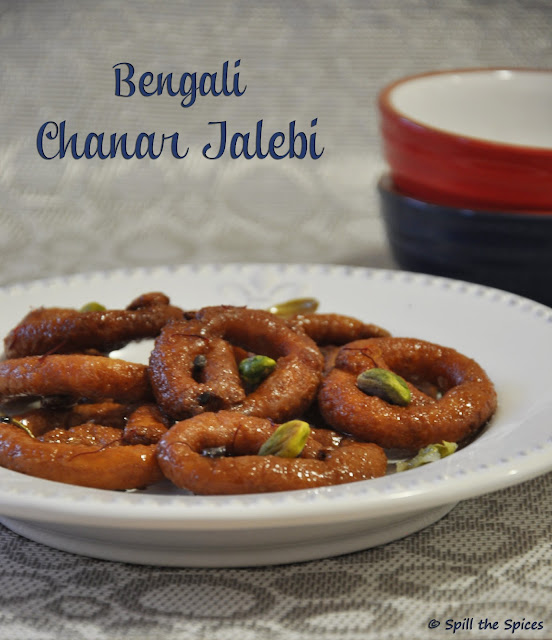 This month Chandrani of Cuisine Delights has challenged the Southern team with Bengali chanar/paneer jalebi. 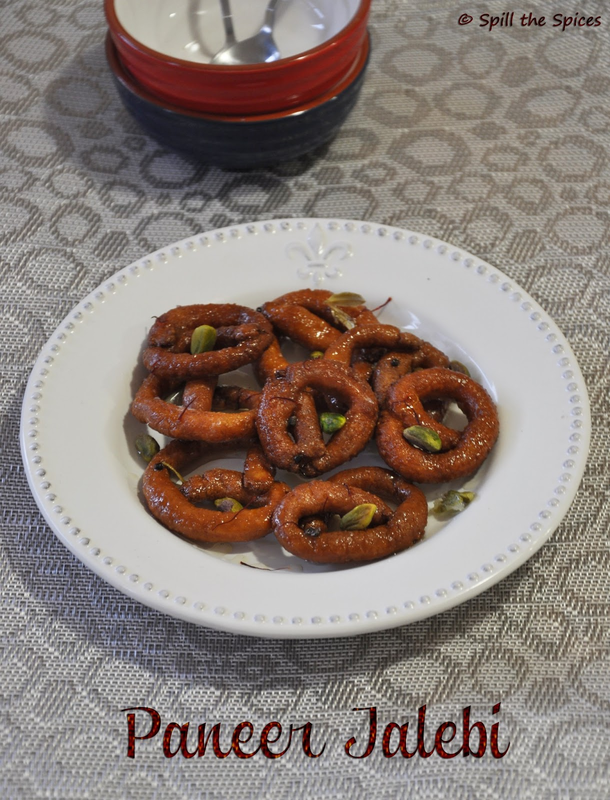 Chanar jalebi is made with fresh paneer, shaped into pretzels, deep fried and soaked in a cardamom flavored sugar syrup. My first attempt was a disaster with a very sticky dough and hard sugar syrup! Not wanting to throw it away, I made small balls, deep fried and coated them with hard syrup. Nevertheless, I wanted to give a second try rectifying all the mistakes I made previously and ended up with crispy and juicy jalebis! 1. Boil the milk. When milk starts boiling, reduce the heat and add lemon juice little by little and stir lightly. 2. When milk starts curdling, remove from heat and let it stand for 2-3 minutes or until whey water becomes clear. 3. Line a colander or sieve with muslin cloth or cheesecloth. Pour the curdled milk into it and squeeze out the excess water. 4. Keep the sieve on top of a bowl and let it rest for 15-20 minutes or until all water is drained away. 1. Once the paneer has drained well, transfer it to a plate. Add maida, baking powder, cardamom powder and milk. 2. Mix well and knead the paneer for atleast 10-15 minutes to make a smooth dough. 1. In a heavy bottomed pan, add sugar and water. Heat them on high flame and stirring continuously to dissolve the sugar. 2. Bring it to a rapid boil. Do not stir at this stage. Reduce the heat to low and add the crushed cardamom and saffron strands. 3. Let it simmer in low flame for 1-2 minutes or until syrup comes to a sticky consistency. 1. Divide the paneer dough into small round balls. Take a ball and roll it into a long thick rope. Twist the ends of the rope to make a pretzel like shape. 2. Heat oil and deep fry them in medium heat until golden. Immediately dunk into the warm sugar syrup. Let the jalebi stand in the sugar syrup for 3-4 hours. Enjoy these crispy jalebis hot or cold garnished with nuts. 1. Make sure water is completely drained from paneer otherwise the dough will become very sticky. 2. While rolling the paneer balls into ropes, some will start cracking. Lightly moist them and roll again. Sorry for not visiting ur space for past few days, But hereafter i won't miss here...yumm dear... love it..
chanar jalebi s something that i ve never eaten before Sona n it looks like you nailed this one perfectly. Lovely jalebis, looks so yummy! Love to have some, who can resist to this chanar jalebi. Wow.. Perfect looking jalebis :) Looks yum !! Paneer jalebi looks very delicious and tempting.